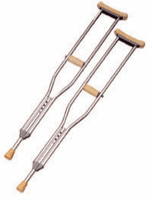 Scroll down to see our selection of Crutches for sale. We carry several different brands of crutches in many different styles, for your individual needs such as forearm crutches, folding crutches, underarm crutches, and come in various sizes, we carry youth crutches, adult crutches that adjust from average to tall sizes and are offered in several colors as well, we also carry many crutch accessories to personalize your needs. Crutches are one of our products that unfortunately many of us have needed at some point. Our crunches are manufactured from best quality material, and designed with your comfort and safety in mind, you may require the standard underarm crutch, or may prefer the forearm crutches with handgrips for added stability, we also carry pediatric crutches for children, Height adjustable crutches are an important factor in your comfort and posture during use, so we have made available many sizes to choose from that range from that will accommodate most anyone including persons well over 6ft. Please feel free to contact our customer service department if you have question. ..